Many organizations have unique, complex and rapidly changing business requirements. These requirements represent key competitive differentiators in terms of organizational effectiveness and operational efficiency. Typically, many of these key requirements are not supported or not adequately supported by vendor commercial solutions. Accordingly, these requirements are supported by systems developed in-house or by extensively modifying vendor commercial solutions. Or, very often, these requirements are supported by an assortment of Excel spreadsheets, Access database and SharePoint portals manually stitched together through business processes, policies and procedures. Each of the scenarios above has significant risk. Extensively modifying vendor commercial solutions (and modifying upgrades) is expensive, time consuming and creates vendor dependency. In-house development is difficult, expensive and time consuming in terms of "getting the requirements right" and developing, designing and developing a supporting technical architecture and developing the code base. The low-tech approach of utilizing Excel spreadsheets, Access databases and SharePoint portals manually stitched together through business processes, policies and procedures is fragile. The business knowledge for supporting the requirements is largely maintained tribally in the minds of the people doing the work – often just a few key people with little or no depth on the talent bench. However, the biggest risk is business competitiveness. These requirements represent key competitive differentiators in terms of organization effectiveness – creating customer value, and operational efficiency – operating in the most economical manner to maximize effectiveness. Each of the scenarios above present significant challenges to rapidly and effectively supporting and adapting to unique, complex and rapidly changing requirements to maintain the competitive edge. InteqApps™ - The fastest and most effective solution to support your unique, complex and rapidly changing business requirements. The InteqApps™ cloud based application development solutions provide your organization with an enterprise class cloud based application platform and sophisticated application software functionality to support your unique and complex requirements. The InteqApps™ cloud based application development solutions are extensible, scalable and adaptable to support rapidly changing requirements and is interoperable to enable other systems in your organization to leverage the functionality of the InteqApps™ solution. The InteqApps™ cloud based application development solutions puts you in control of your requirements - enabling your organization to focus on maintaining the competitive edge, maximizing customer and business value and optimizing the operational efficiency of supporting business processes. InteqApps™ is the next generation platform for rapidly developing and deploying cloud-based application software solutions, with enterprise class sophistication, to support unique, complex and rapidly changing business requirements. Traditional custom application solutions typically require 6-12+ months – and still only deliver constrained “get-it-done” class functionality (difficult to use, marginally acceptable functionality, maintenance intensive, etc. )that often failsto meet key business needs and user expectations. The InteqApps™ cloud basedapplicationdevelopment framework (development approach, software component library, cloud baseddelivery platform) enables us to work closely with your SMEs, analysts, technical team and other stakeholders to rapidly develop and deliver extremely high-quality cloud-based custom application software solutions (typically in8-16 weeks) – with enterprise class sophistication (extensible, scalable, adaptable and interoperable). We apply our acclaimed model driven analysis approach (Inteq’s MoDA/Framework™) to rapidly analyze your business requirements (business process activities and workflow) to identify and define business and user functional requirements. In parallel, we leverage our library of hundreds of application software components (prebuilt business functionality - see partial list below) and our cloud baseddelivery platform (architecture, security, infrastructure, etc.) to provide a solid foundation for a custom applicationsoftware solution. Think of the InteqApps™ cloud based application software components as a set of configurable Lego® building blocks. Each component represents a cohesive unit of functionality that comprehends an abstracted pattern of business rules, processing logic and data structures that seamlessly integrate with the other components. The InteqApps™ cloud based application software components can be rapidly assembled and configured into infinite combinations of application software functionality. We rapidly extend the foundation to support your unique business rules and requirements to deliver an enterprise class custom application software solution - immediately deployable within your hosting infrastructure or commercial environments such as Amazon's EC2. 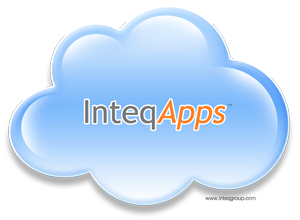 InteqApps™ cloud based application software development solutions are in your control. Your organization has complete access to the code base to modify and revise the code to support your changing business requirements. Your organization controls the destiny of InteqApps™ cloud based application software development solutions and is not held captive to expensive vendor seat licensing agreements and the cost (and timing) of vendor modifications. We look forward to discussing your business requirements, InteqApps™ cloud based application software development options and to provide a live demo of the InteqApps™ platform and software components.